Consolidate, Automate and Streamline Your Receivables on a Truly Integrated Platform. FTNI continues gaining momentum in the distribution industry, bringing on 30+ food and beverage distributors in the past 24 months. FTNI's ETran integrated receivables platform is a proven solution for leading distribution companies across the U.S. and Canada. In fact, ETran now supports the A/R operations of a fast-growing number of distributors serving customers across every state in the U.S. and several regions in Canada. FTNI has partnered with the likes of Frosty Acres Brands, Golbon, UniPro, eoStar, and NCR to create a network of partnerships and integrated capabilities to deliver additional value for our distribution partners and customers. Any Payment Method. Any Payment Channel. One Platform. — Accept, process, AND post any payment method (checks, ACH, credit card, cash), from any payment channel (called-in, mailed-in, lockbox, in-person, online, mobile)—all on a single, secure, SaaS platform. Increased Customer Convenience – Convenient online payment options via FTNI’s online payment portal give distributors customers the ability to view, select and pay open invoices whenever is most convenient to them. Distributors can allow customers to pay via ACH or Credit Card based on each customer’s unique payment terms. 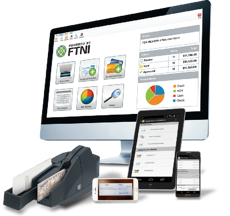 Faster Payments in the Field – FTNI’s ETran Mobile payment application enables distributors field representatives to securely accept check, ACH or credit card payments on the spot, while also easily associating the payment(s) with open invoice items via complete mobile invoice presentment and payment functionality within the app. This also helps accelerate exception handling, increase cash flow and reduce DSO as payments can be worked earlier in the day since AR departments no longer have to wait for reps or drivers to bring payments back to the office. Our newest enhancements allow mobile users (e.g. sales reps) the convenience of only viewing their owned accounts/customers' invoices. Simplified Recurring Payments — ETran's EIPP functionality enables distributors to leverage intelligent AutoPay features across both ACH and credit card payment methods, that automatically initiates regularly recurring payments based on upcoming invoices according to each individual customer's unique payment terms. Proactive reminder notifications can also be sent to customers several days before the transaction, reminding them of their upcoming payment(s) and the invoices to be paid. Decreased DSO – Delivering customers with more convenient payment options via a single, unified platform, combined with the ability to automatically update back-office accounting/ERP/CRM systems has helped leading distributors such as Shamrock Foods decrease DSO by upwards of four days in some cases. After all, operating from a single platform gives you the oversight and efficiencies needed to free up your most valuable resources for higher value functions than posting cash for eight hours each day. Are you ready to streamline your AR operations on a single platform? Sign-up now to schedule a 30-minute, no obligation demo. Discover the industry's leading integrated receivables platform that is helping other leading distributors drastically decrease DSO and increase cash flow. Accept any payment method (check, ACH, credit/debit card, cash) on a single, unified platform. Mailed-in, lockbox, called-in, in-person, autopay, online and mobile — all on a single, SaaS platform. Accept, process, AND post payments and associated remittance information in a single pass. Scan single or multiple remittance documents (up to 8.5" x 11") to associate with each transaction. Convenient SaaS delivery — easily add new locations, payment methods and channels in clicks. Complete oversight and direct access to all your receivables items via a single, unified interface. Streamline and automate business processes and workflows to increase efficiencies and save cost. Seamless integration with any back-office system, banking institution(s) and merchant processor(s). Leverage multiple layers of security and compliance — PCI DSS Level 1, SSAE 16, HIPAA and more.